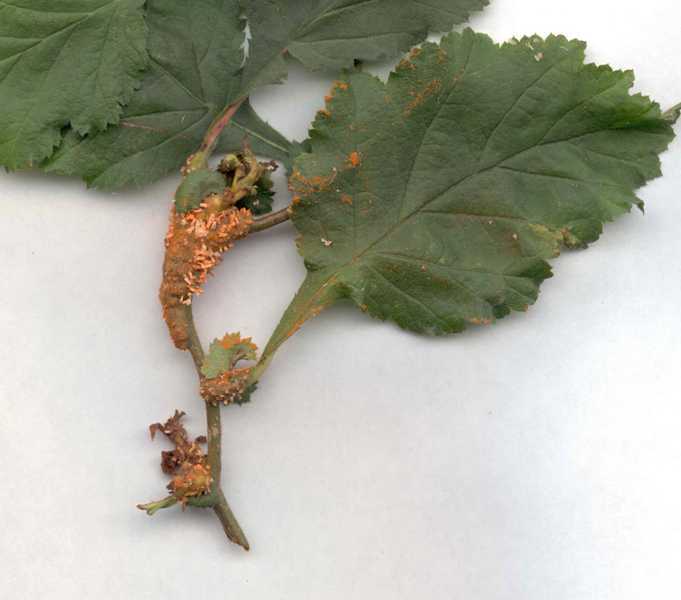 Cedar-apple rust (Gymnosporangium juniperivirginianae), cedar-hawthorn rust (G. globosum), and cedar-quince rust (G. clavipes) are closely related rust diseases that require two hosts to complete their life cycle. 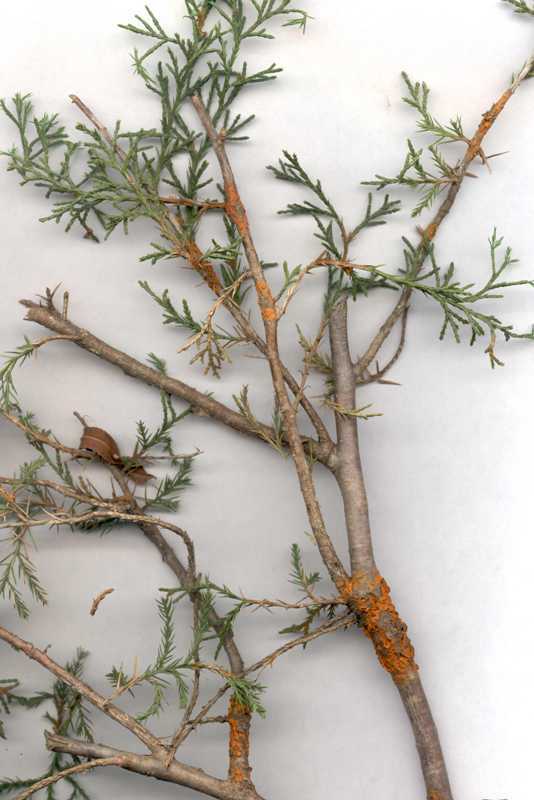 All three rusts can infect most varieties of eastern red cedar (Juniperus virginiana) as well as many other junipers and an alternate host. 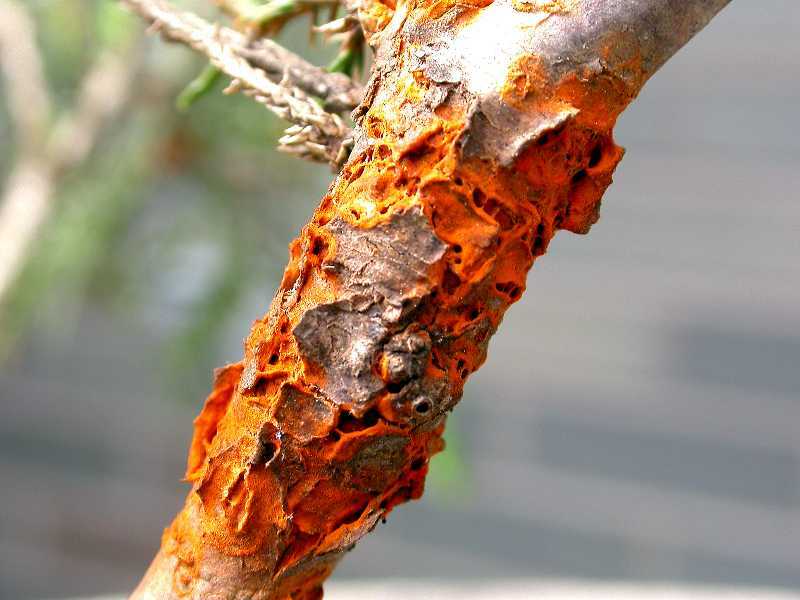 Cedar-quince rust has the broadest host range and can affect many genera in the rose family including apple, crabapple, pears, quince, hawthorn, serviceberry, mountain-ash, flowering quince, cotoneaster, chokeberry, and photinia. 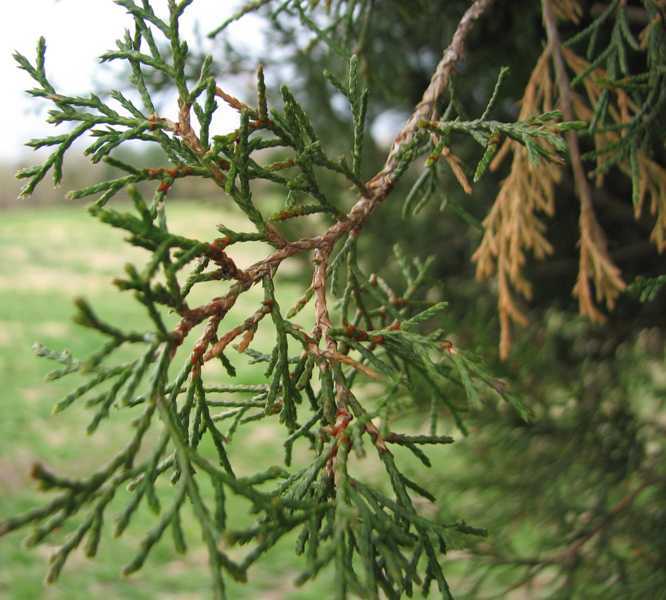 Symptoms on juniper: Perennial, elongated swellings on the tips of twigs and branches, which may crack and form cankers, are symptoms of cedar quince rust on red cedars and junipers. In damp spring weather, cushion-shaped, orange, gelatinous blisters burst through the bark where the branches are swollen. 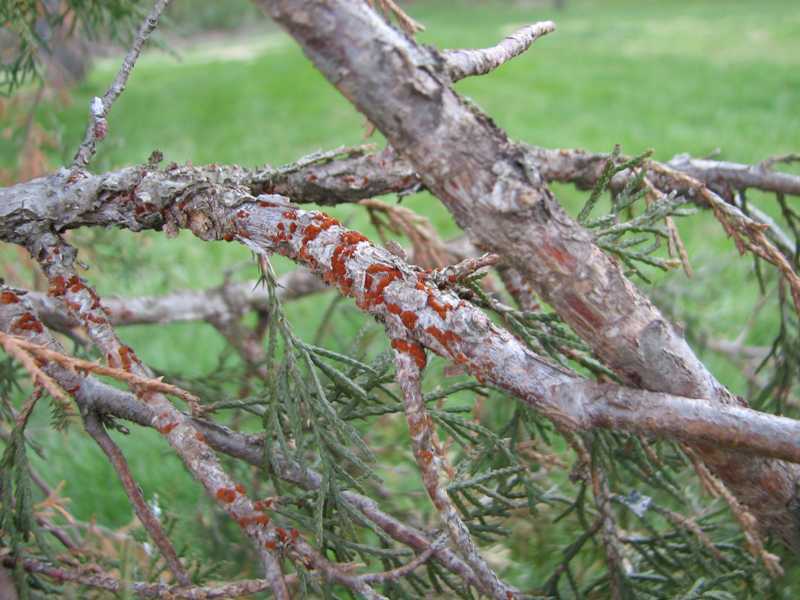 Cedar-quince rust disease damages the ornamental value of susceptible cedars and junipers, killing young branches and weakening plants when cankers occur on the main trunk. Symptoms on apple and other hosts: Young branches and fruit (not leaves) are usually infected and symptoms vary widely among the various hosts. On hawthorn, the pinkish aecia (tubes) occur mainly on branches, thorns, and fruit. 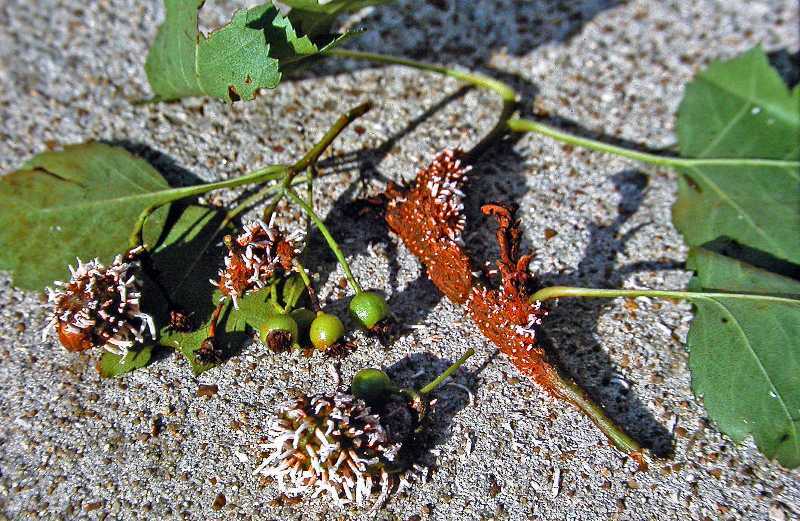 Hawthorn and serviceberry fruit often becomes heavily covered with aecia. 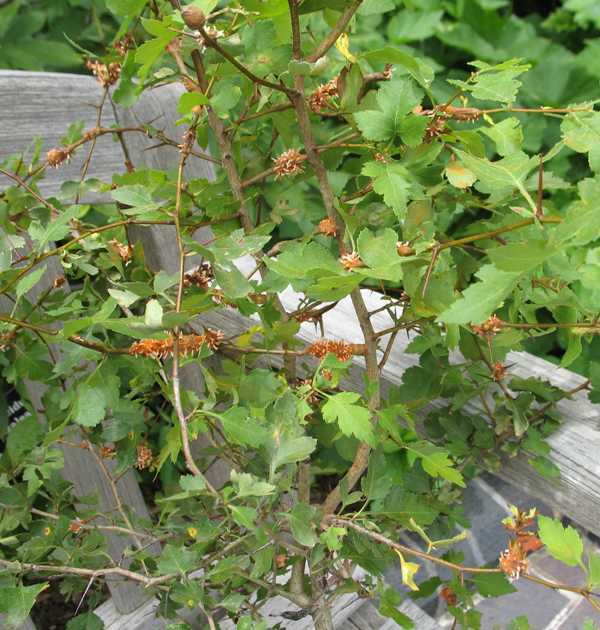 Branch and thorn infections result in spindle-shaped, perennial cankers that expand each growing season. 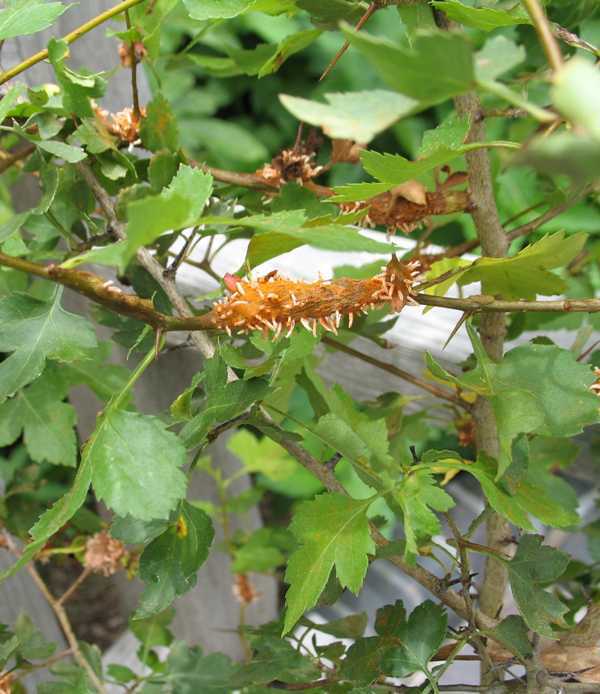 However, most infected branches are girdled by the canker during the second season, causing dieback to a bud or side-shoot. Basidiospores that are released from the juniper gall telial swellings infect stems and fruit of quince and the other deciduous hosts. Seven to ten days after infection, spots or swellings develop, followed a few days later by the formation of tiny black dots within the spots. Four to seven weeks later, aecia are formed. 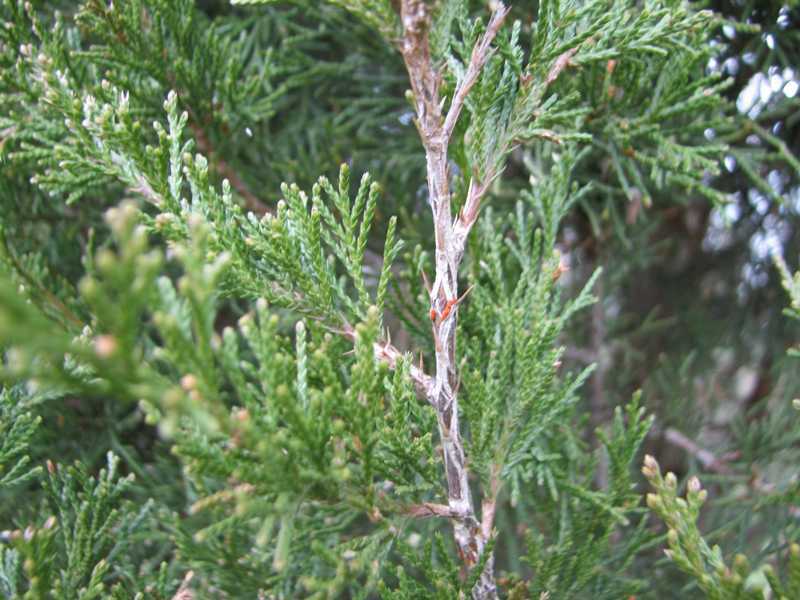 Aeciospores, released from the aecia during rain or as morning humidity lowers, become airborne and infect susceptible junipers during late summer and fall. 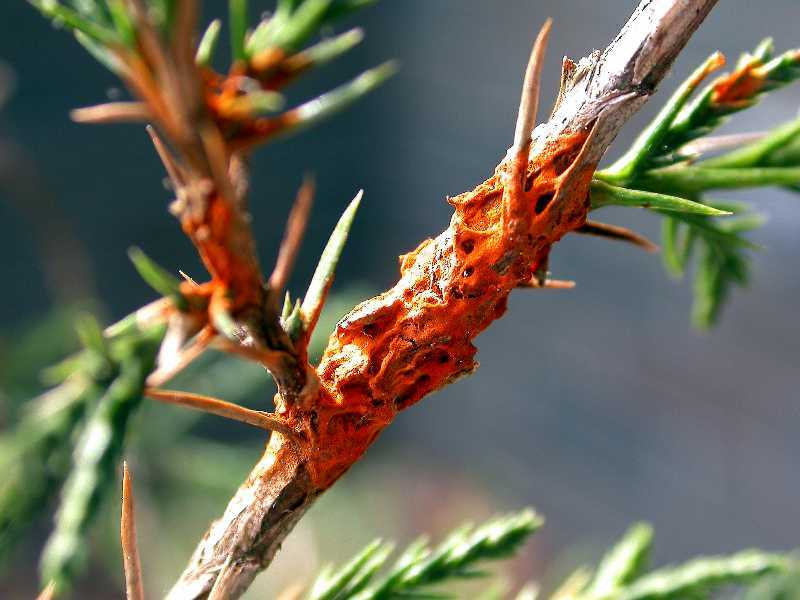 The following spring (or one year later), swellings (consisting of both fungal and host plant tissues) develop on the juniper host. When the swellings are mature, a few hours of wet, cool (74 to 78 degrees F) spring weather are sufficient for repeated telial swelling and the release of basidiospores that infect quince and other deciduous hosts. 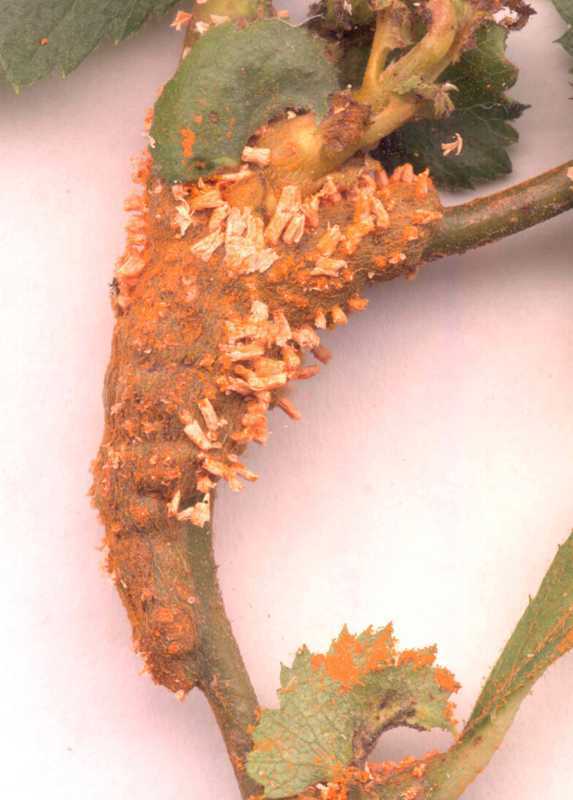 The cedar-quince rust galls may remain infectious for 4–6 years or more (up to 20), whereas the cedar-apple gall is only infectious for one year. 1. Prune. 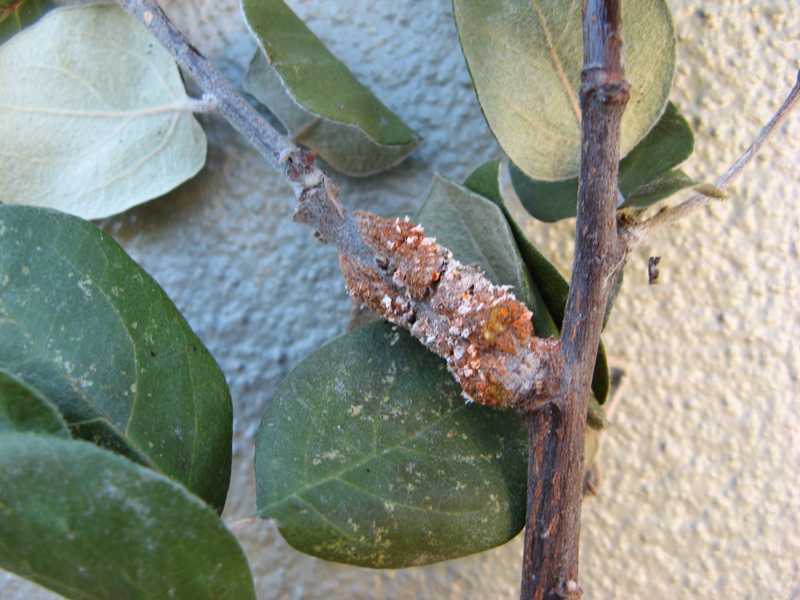 Prune out cankers associated with cedarquince rusts from landscape junipers and deciduous host plants. 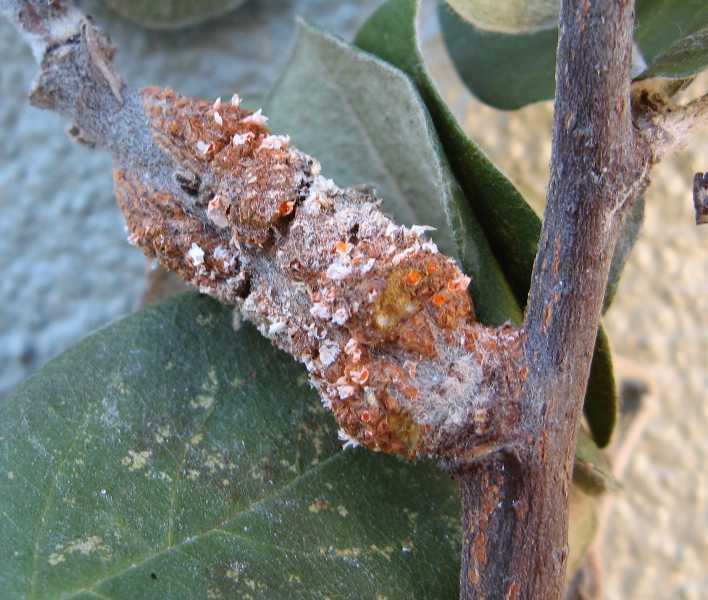 The spread of cedar-quince rust can be limited by reducing the infested plant parts. 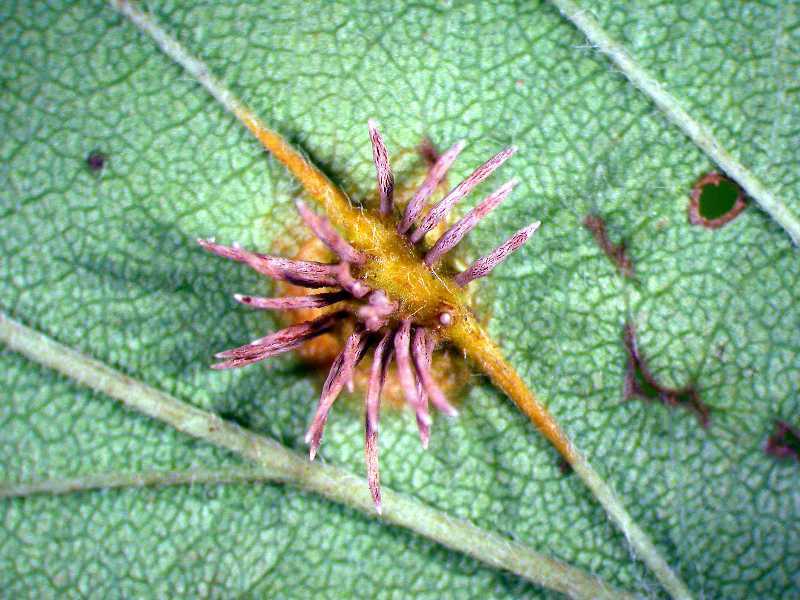 This is practical if a few plants are infected and the number of galls per plant is limited. 2. Co-exist. Live with the disease. 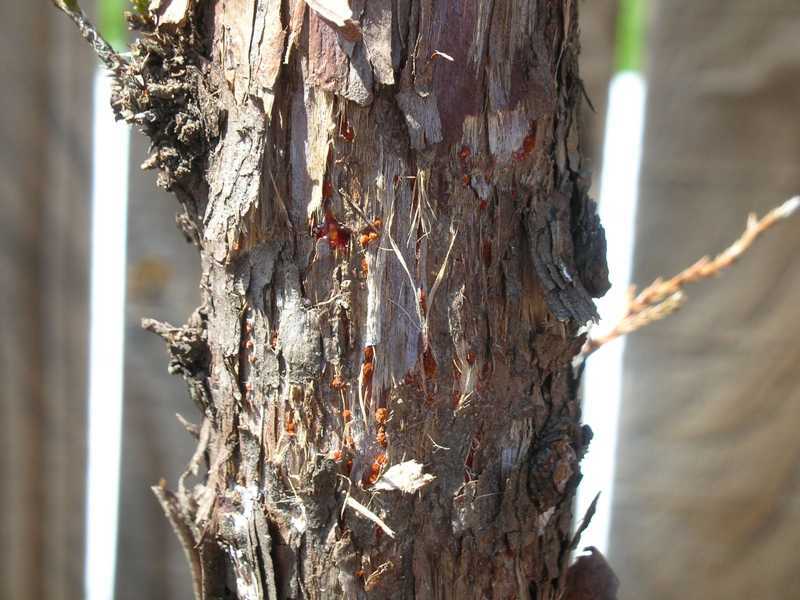 It may disfigure plants when twigs are infected. 3. preventive fungicide. Use preventive fungicides labeled for use on quince and other hosts. 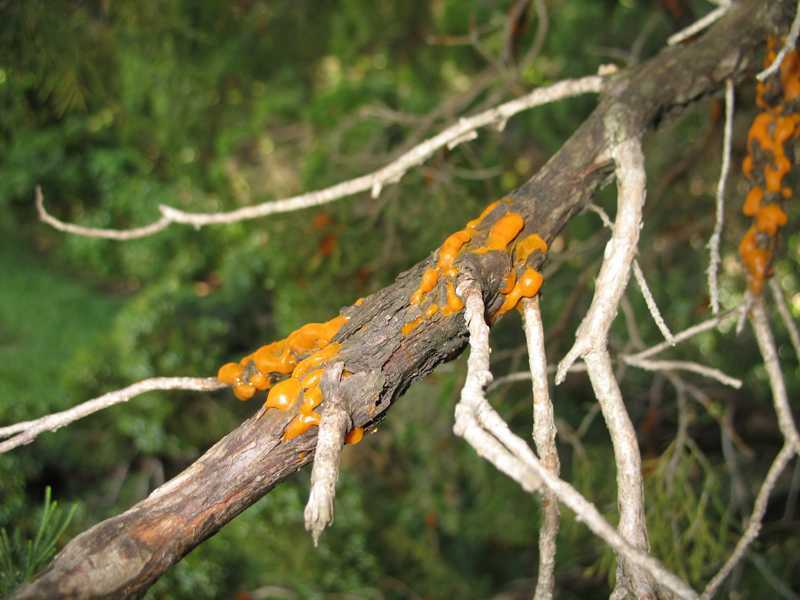 Fungicide sprays are aimed at protecting developing twigs and branches from infection during the time the galls on the junipers are orange and gelatinous. 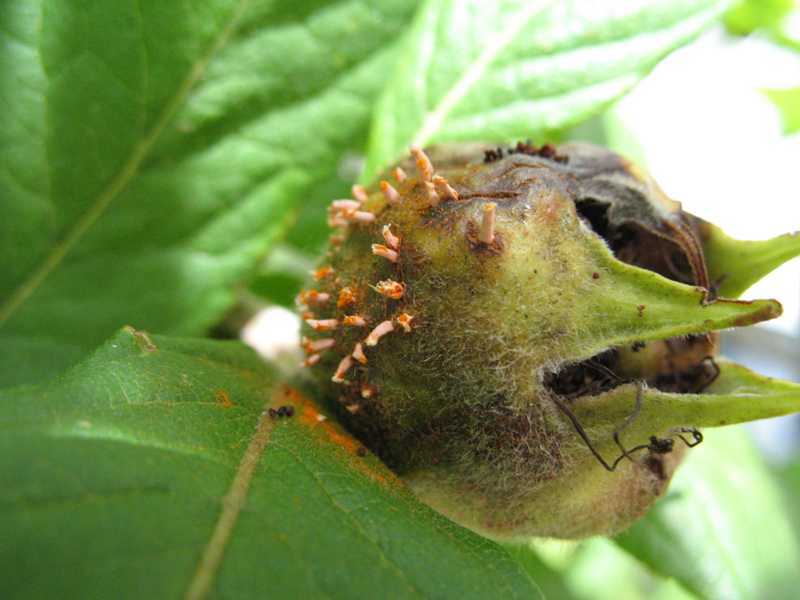 This usually lasts for several weeks and fungicide applications are not necessary once the galls become dry and inactive. Always read and follow label directions. Pesticides registered for use include captan, chlorothalonil (Daconil), mancozeb, sulfur, thiram, and ziram. 4. Avoid planting susceptible plants together. 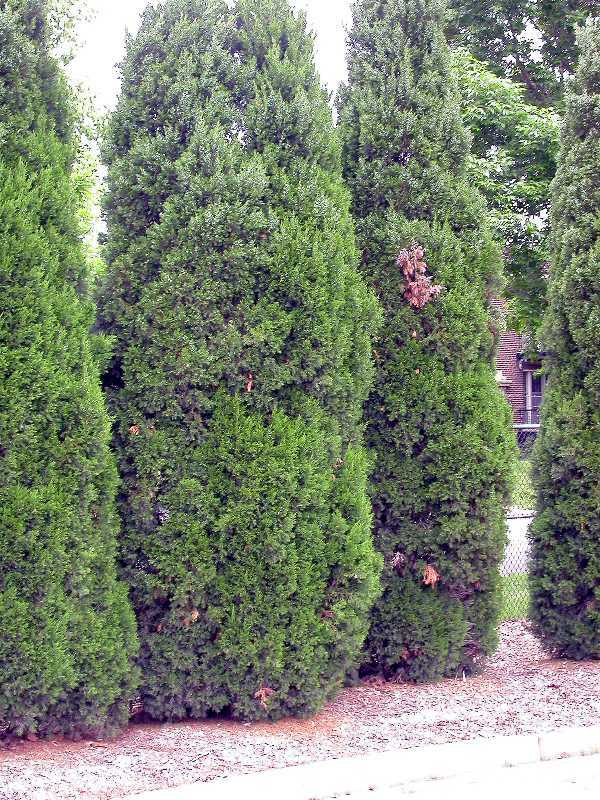 Do not plant junipers close to susceptible varieties of apples, crabapples, or quince. 5. Resistant varieties. Remove and replace diseased plants with resistant varieties. Apples: ‘Redfree’, ‘Liberty’, and ‘William’s Pride’. Strategies 1, 2, 4 and 5 are strictly organic approaches. Of the fungicides listed in Strategy 5, consult the Organic Materials Review Institute (OMRI™) for appropriate organic sulfur products.